Arab media condemns Israel for Arab terrorist's ramming attack on Israeli youth, Arab civilians hand out candies celebrating success. Responding to Sunday's car ramming attack, which killed four 20-year-old IDF soldiers and injured 15 others, Iran's Abna24 News Agency wrote, "The Palestinian attacker was martyred by Israeli fire during the operation." They identified the Palestinian as Fadi al-Qanbar, "a former prisoner in the Israeli jails." The article called the IDF soldiers "Israeli occupation soldiers" and the murderer a hero. It is titled "Israeli soldiers killed in Palestinian's heroic truck-ramming operation in Al-Quds." The young Israelis deserved to be murdered, according to the Shia news agency: "Israeli police said a truck with Israeli license plates veered from its course and rammed into a group of uniformed Israeli soldiers at a promenade in the settlement of East Talpiyyot [sic], which overlooks the Old City of East al-Quds." "A number of people were initially trapped under the truck, and three of the wounded had to be extracted from under the track using a crane." The Armon Hanetziv/ Talpiot neighborhood of southern Jerusalem id described as "The illegal East Talpiyyot [sic] settlement is also known as Armon Hanatziv" and the agency took care to point out its location as being "just west of Jabal al-Mukabbir," the neighborhood in which the terrorist lived. Meanwhile, Arab civilians in both Gaza and Judea and Samaria bought and distributed candies in celebration of the murderous attack. 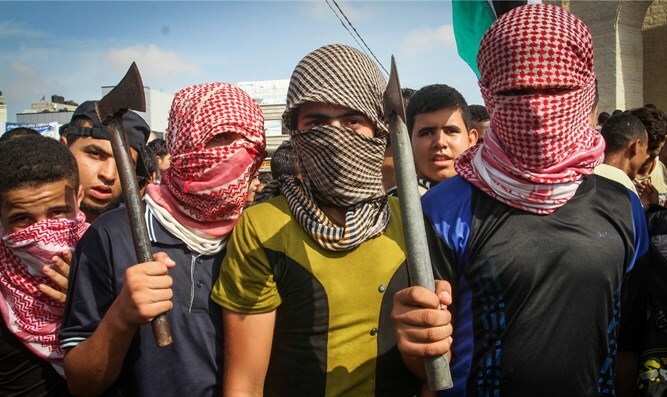 Hamas on Sunday praised the terror attack, calling it "a natural response to the Israeli occupier's crimes and proof that the Jerusalem Intifada is not over."